The Client can rent snow sports equipment (bikes, e-bikes, in line skates, kickbikes, electroboats, powerboats, pedalboats, rowingboats, sailingboats and other equipment and accessories) for a rental period agreed in the rental contract. The rental contract will be signed by the Client to confirm that said sport equipment was accepted for use by the Client. The text of the rental contract is shown on the front side of this document. The present terms and conditions constitute an integral part thereof. No third parties can use the rented sports equipment. Rental Price will be paid before accepting sports equipment for use. The Client will return all rental equipment to the shop by the agreed date and time. It will be clean with reasonable wear and tear that occurs as a result of using the equipment for its intended purpose during the rental period. If the agreed rental period of sports equipment is exceeded, the Client undertakes to pay the Rental Price according to the Pricelist for the time of use exceeding the rental period as agreed. If sports equipment is returned before the agreed date, pro-rata refunds on Rental Price will not be given to the Client. The Client will prevent any loss or theft of sports equipment while being in his/her possession. If sports equipment is lost or stolen, or in case of any other event where as a result, the Client is unable to return sports equipment to the Owner, the Client will compensate all damages incurred by the Owner. If sports equipment, or any part thereof is damaged due to the Client’s negligence, the Client will fully compensate the Owner for damages, i.e. especially costs associated with restoration of sports equipment, or any part thereof according to the service pricelist. Also, the Client will fully indemnify the Owner in respect of any damage if damage to sports equipment, or any part thereof is caused by wilful misconduct of the Client. If sports equipment, or any part thereof is completely destroyed, the Client will compensate the Owner at the amount equal to the residual value of sports equipment, or its unusable part. Rules for the use of sports equipment: The Client will only use sports equipment for its intended purpose and prevent damage resulting from any situation which could have been foreseen. Sports equipment will be returned free of heavy soiling. The Owner is not liable for any items, things or documents (including identity documents) brought to the board of any hired sports equipment (electric boats, motor boats, sailing boats, paddle boats, rowing boats, paddle boards) or for any damage caused to such items, things or documents, or for any loss suffered by customers or other persons present on hired boats; similarly, the lessor is not liable for any damage or loss caused to third persons by customers or other persons present on the boats hired by customers. By signing these general terms and conditions, the Client confirms they have read and understand the text of the rental contract as well as the text of these general terms and conditions and they have no reservations thereabout. The Client agrees that the Owner may obtain machine-readable data from his/her identity card or passport, namely as follows: name, surname, date of birth, number and type of the identity document, and the expiration of the identity document for the purpose of further processing under Section 15 hereof. Clients of the rental shop recognize the Owner can take pictures of clients or capture clients on video and audio records in the rental shop on the occasion of various events. Clients agree that such pictures and video or audio records (hereinafter referred to as “Records”) will be free of charge. Further, they agree the Owner can at no cost publish Records (e.g. 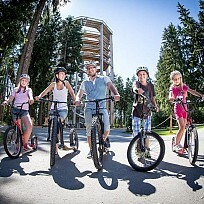 photographs) showing clients to promote and advertise its business, exclusively on the following websites www.lipnoservis.cz, www.skiareallipno.cz, zima.lipnoservis.cz, www.lipno.info, www.activeparklipno.cz, www.lipnoservis.cz, www.stezkakorunamistromu.cz, www.campinglipno.cz and on the Facebook profiles of Skiareál Lipno, Active park Lipno, Camping Lipno Modřín, or in any printed publicity material published by the Owner to this end and distributed to third parties. The list of publicity materials where Records can be published is available from the Owner's marketing department. In the event of a dispute arising out of or in connection with the purchase contract / service contract between the Provider/Seller/Owner and the Client having the status of a consumer which the parties fail to settle by mutual contract, the consumer may file a petition for extrajudicial settlement of such dispute to an alternative dispute resolution entity, namely the Czech Trade Inspection Authority, Central Inspectorate – ADR Department, Štěpánská 15, 120 00 Prague 2, Email: adr@coi.cz (mailto:adr@coi.cz), Web: adr.coi.cz (https://adr.coi.cz/). The consumer can use the online dispute resolution (ODR) platform developed by the European Commission at http://ec.europa.eu/consumers/odr/. These general terms and conditions will become effective as of April 1, 2019. The Operator reserves the right to make changes to these Rules at any time. The consumer can use the online dispute resolution (ODR) platform developed by the European Commission at ec.europa.eu/consumers/odr/. These general terms and conditions will become effective as of December 1, 2017. The Client can rent snow sports equipment (bikes, downhill scooters and accessories) for a rental period agreed in the rental contract. The rental contract will be signed by the Client to confirm that said sport equipment was accepted for use by the Client. The text of the rental contract is shown on the front side of this document. The present terms and conditions constitute an integral part thereof. No third parties can use the rented sports equipment. A rental contract is only effective if rental is paid for the agreed period of use (hereinafter referred as “Rental Price”). Rental prices are based on the pricelist available in the Rental (hereinafter referred as “Pricelist”). The Client hereby warrants they know and understand and accept the pricelist as above stated. Rental Price will be paid before accepting sports equipment for use. Maximum length of rent is 45 minutes. The Owner reserves the right to refuse to lend sports equipment to the customer without giving reasons. 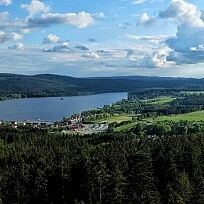 The Client is obliged to return the sports equipment by the downhill station of the chair lift Lipno Express, to the Intersport Rent Lipno employee in a state of reasonable wear and tear that corresponds to due use for the concluded period in accordance with the purpose for which it is determined. Scooters refund if the customer requires and solely at the customer's request, confirm cableway operator or worker at the Intersport Rent using stamps - Returned + return date on the receipt, the customer has received the payment of rent. Because of safety reasons it is prohibited to carry children on the scooter. For security reasons, the Renter allows to rent the scooter to children, it is not possible to require automatic rent of scooter. The customer must be older than 15 years old. It is forbidden to make any changes and services on the scooter. The Client agrees that the Owner may obtain machine-readable data from his/her identity card or passport, namely as follows: name, surname, date of birth, number and type of the identity document, and the expiration of the identity document for the purpose of further processing under Section 13 hereof. These general terms and conditions will become effective as of April 1, 2019. The Operator reserves the right to make changes to these Rules at any time. The Client can rent snow sports equipment (skis, snowboard, ski/cross country ski/snowboard boots, ski poles and accessories) for a rental period agreed in the rental contract. The rental contract will be signed by the Client to confirm that said sport equipment was accepted for use by the Client. The text of the rental contract is shown on the front side of this document. The present terms and conditions constitute an integral part thereof. No third parties can use the rented sports equipment. A rental contract is only effective if ski rental is paid for the agreed period of use (hereinafter referred as “Rental Price”). Ski rental prices are based on the pricelist available in the Ski Rental (hereinafter referred as “Pricelist”). The Client hereby warrants they know and understand and accept the pricelist as above stated. Except as otherwise provided in Section 3 below, the Client will pay a non-refundable 3 % breakage insurance together with the Rental Price (hereinafter referred as “the Insurance”). The front side of this document shows the fee in the “Breakage Insurance” column. The Insurance will be calculated from the full rental price, excluding any rental discount offered to the Client by the Owner. The discount is only related to Rental Price and Insurance is not affected thereby. The Client may expressly refuse to pay Insurance no later than before payment of Rental Price. In such case, if the sports equipment, or any part thereof is damaged, the procedure under Section 10 hereof will apply. If the agreed rental period of sports equipment is exceeded, the Client undertakes to pay the Rental Price plus the relevant Insurance according to the Pricelist for the time of use exceeding the rental period as agreed. If sports equipment is returned before the agreed date, pro-rata refunds on Rental Price or Insurance will not be given to the Client. If the Client paid Insurance under Section 2 & 4 hereof, the Parties agree on the following provisions concerning the method and scope of compensation: If damage to sports equipment, or any part thereof is due to the Client’s negligence, the Owner will use Insurance to compensate the Owner for damages caused to sports equipment, or any part thereof. By payment of Insurance, the Owner's claim for compensation of any incurred damage is fully settled. The amount of compensation paid by the Client will hereby be reduced to a lump sum, i.e. insurance fee. The Client is not entitled to any refund on Insurance if sports equipment is returned without damage. The payment of Insurance does not cover damages in the case as provided under Section 8 hereof. If the Client refuses to pay Insurance in compliance with Section 3 hereof and if sports equipment, or any part thereof is damaged due to the Client’s negligence, the Client will fully compensate the Owner for damages, i.e. especially costs associated with restoration of sports equipment, or any part thereof according to the service pricelist. Also, the Client will fully indemnify the Owner in respect of any damage if damage to sports equipment, or any part thereof is caused by wilful misconduct of the Client. Rules for the use of sports equipment: The Client will only use sports equipment for its intended purpose and prevent damage resulting from any situation which could have been foreseen (e.g. no skiing on terrain without continuous snow cover, or drying ski boots on heat sources or in their immediate proximity with imminent risk of heat damage, etc.). Sports equipment will be returned free of snow and heavy soiling. The Owner reserves the right to amend these general terms and conditions. The Client agrees that the Owner may obtain machine-readable data from his/her identity card or passport, namely as follows: name, surname, date of birth, number and type of the identity document, and the expiration of the identity document for the purpose of further processing under Section 17 hereof. Clients of the rental shop recognize the Owner can take pictures of clients or capture clients on video and audio records in the rental shop on the occasion of various events. Clients agree that such pictures and video or audio records (hereinafter referred to as “Records”) will be free of charge. Further, they agree the Owner can at no cost publish Records (e.g. photographs) showing clients to promote and advertise its business, exclusively on the following websites www.lipnoservis.cz www.skiareallipno.cz, zima.lipnoservis.cz, www.lipno.info,www.activeparklipno.cz,www.lipnoservis.cz, www.stezkakorunamistromu.cz, www.campinglipno.cz and on the Facebook profiles of Skiareál Lipno, Active park Lipno, Camping Lipno Modřín, or in any printed publicity material published by the Owner to this end and distributed to third parties. The list of publicity materials where Records can be published is available from the Owner's marketing department. These general terms and conditions will become effective as of December 1, 2018. The Owner of Skischool Lipno is LIPNO SERVIS s.r.o., having its registered seat at Lipno nad Vltavou 307, 382 78 Lipno nad Vltavou, Company Registration Number 26016885, registered in the Companies Registry at the Regional Court in České Budějovice, File no. C 9229 (hereinafter referred to as the “Owner")..
For the purpose hereof, Skischool Lipno is referred to as „Skischool Lipno“ or „Ski School“. The Ski School offers ski and snowboard lessons. The Ski School office is located in the building Chata Lanovka on the premises of the Owner (hereinafter referred to as the “Office”). These general terms and conditions of Skischool Lipno are available from the Office, and the Owner's booking office, or online on the Owner's website at https://www.lipno.info/provozni-rady.html, “Skischool Lipno “(hereinafter referred to as “GTC“). Based on the type of course, the Owner offers ski and snowboard lessons taught by qualified ski / snowboard instructors, consisting in professional instruction and guidance. For the purpose of regulation of the rights and obligations of the parties and to safeguard the process and organisation of lessons, the Owner has adopted the operating rules of Skischool Lipno that are available from the Office, or the Owner's booking office. After payment of the course fees, the Client will receive a receipt (proof of payment) and two Ski School client cards. Course places are not transferable. After payment of the course fees, the Client may attend ski lessons with the schedule and parameters listed on the card. By payment of the course fees, the Client agrees to GTC and the operating rules of the Ski School. Before the start of each lesson, the Client must identify themselves to the instructor with a valid Client card. If they fail to do so, they may not be allowed to be part of the lesson and in such case, no refund can be claimed. Klient je povinen se prokázat před započetím každé výukové lekce instruktorovi platným průkazem klienta lyžařské školy. Pokud tak neučiní, nemusí být na výuku přijat, přičemž nemá v takovém případě nárok na vrácení kurzovného. The loss of the card must immediately be reported to the Office of the Ski School. To receive a duplicate card, the Client must produce proof of payment. No refund will be given by the Ski School for unused lessons. d) In person at the Owner's booking office. Course booking is binding if made one of the ways above described. The current pricelist of all courses offered by the Owner for given season is available from Owner's booking office or online via the Owner's website http://zima.lipnoservis.cz/lyzarska-skola/ under the tab “Pricelists“. The course fees must be paid at the Owner's booking office no later than 20 minutes before the start of the lesson, otherwise the booking expires without compensation. The course fees can be paid with cash in CZK or EUR, or credit card. Upon payment of the course fees, the party becomes a Client of the Ski School and enters into a contract between the Client and the Owner with respect to given course (hereinafter referred to as “Contract”). The Owner becomes entitled to payment of the course fees when the course is booked. If the Client cancels a booked course before its commencement, the cancellation fee as provided in Section 28 below will be charged. After payment of the course fees, the Client will receive a receipt (proof of payment) and two Ski School client cards. Course places are not transferable. After payment of the course fees, the Client may attend lessons with the schedule and parameters listed on the card. By payment of the course fees, the Client agrees to these GTC of the Ski School. Before the start of the first lesson, the Client will return the bottom of the card to the instructor and keep the top for possible inspection that may be performed by the Owner at any time during lessons. The Owner is obliged to provide ski or snowboard lessons taught by qualified ski or snowboard instructors according to the type of course, consisting in professional instruction and guidance. The training program / courses made up of individual lessons are aimed at mastering the basic techniques of skiing or snowboarding sports (hereinafter referred to as “ski lessons”). For the purpose of the operating rules, skiing will also mean snowboarding if a Client is attending snowboarding instead of ski lessons. The provisions of the operating rules will equally apply to skiing and snowboarding. The Client will attend lessons at their own risk and responsibility and they are aware that skiing is a sport with an increased risk of injury. Before the start of the course, the Client must inform the instructor about their skiing ability level and communicate other important information, in particular any health limitations and other significant facts concerning the Client's health. The Owner will be considered to have exercised all care that may reasonably be expected to prevent any damage or loss if before the practical part of lessons considering the Client's skiing ability level, the instructor explains the theory and and delivers professional training based on the Client's skiing ability level to teach the techniques of skiing. Provided that legal obligations are not breached, the Owner is not liable for any damage incurred during lessons to health or property of the Client of third parties caused by accident or by the Client or by any external event. Legal representatives of minors must ensure that minors follow the guidance of the instructor. The Client, or their legal representatives are responsible for appropriate clothing, sports equipment and their state of health. The Client who seems to be improperly dressed or equipped for lessons, or they appear in state of health clearly preventing them to attend a lesson may not be allowed to be part of the lesson and in such case, no refund can be claimed. If the Client has suffered an injury, or any other damage to health during ski lessons, they must report it to the instructor immediately upon discovery of damage, but no later than the end of ski lesson. If the Client does not arrive within 10 minutes after the start of lesson, they may not be allowed to be part of the lesson considering the organisation and training methods and principles and, in such case, no refund can be claimed. During all lessons, the Client must follow the instructions and recommendations of the instructor. The Client must stay safe, ski and board with caution, and keep third parties safe on slopes. The Client who is not following the guidance of the instructor may be excluded from a particular lesson, or from the whole training course and no (partial) refund can be claimed. During all lessons, the Client must observe the rules of the International Ski Federation (FIS) for behaviour of skiers and boarders on ski slopes. These FIS rules are posted at the departure station of the Lipno Express ski lift. If the Client is misbehaving during a ski lesson (i.e. contrary to good manners or in a manner endangering the lives or safety of the Client, other participants, or third parties), they will be excluded from the lesson with no possibility to claim a (partial) refund. In case of repeated misbehaviour, the Client will be excluded from the ski course without possibility to claim a (partial) refund. The Client must wear a special vest, or an arm band of the Ski School for safety reasons. Children under the age of 15 must wear a special safety vest of the Ski School during all lessons to be collected by the Client at the booking office of Skischool Lipno before the start of the first lesson. For safety reasons, solely vests provided by the Ski School may be worn during ski lessons. A Client who is not wearing a special vest will not be allowed to be part of the ski lesson. The same method used for the original payment will at each time be used to make refunds on unused lessons as per the cancellation policy under these GTC of the Ski School, or for contract termination as per these GTC of the Ski School. In case of payment by credit card, the money for the administration fee or unused lessons will be refunded to the credit card account. No cash refund can be given on a credit card payment. The Owner offers the following types of courses, in particular: group, individual and family lessons. The full offer of ski courses organized by the Owner, including their prices and parameters, is provided in the pricelist of the Ski School published for given year of the course. The pricelist of all courses organised by Owner in given season is available from the Owner's booking offices or online via the Owner's website http://zima.lipnoservis.cz/lyzarska-skola/ under the tab “Pricelists “. The method of ski training and a specific course in the Owner's offer is chosen by the Client before paying for the course. Changes to the time schedule or the method of training after the course has been paid, can only be made through the Office if such change is feasible for the Owner with respect to its capacities. If the Owner is unable to cover all requirements for private lessons due to capacity reasons, the Client will be offered an alternative time schedule, or group lessons will be offered instead of private lessons. Group lessons are organized in compliance with the provisions of these operating rules concerning group training. The Owner reserves the right to transfer the Client to a different course with comparable method of training and comparable ski ability level in exceptional cases such as the instructor's illness, etc. If the Client cannot be transferred due to capacity or other reasons, full or pro-rata refunds will be given for lessons not used by the Client for reasons attributable to the Owner. 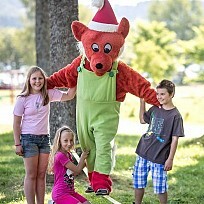 The Client has free access to Foxpark and Skischool Lipno Park during ski lessons (i.e. at times when lessons take place). The Client who is attending group lessons must buy a ski pass for each lesson, otherwise they will not be allowed to participate. A ski pass valid for the whole duration of ski lessons is part of private lessons and private family lessons, with the exception of evening private and private family lessons where the Client must buy a separate ski pass. The Owner does not provide any compensation for lessons unused due to Force Majeure, in particular due to bad weather conditions or as a result of limited operation of ski lifts due to adverse weather conditions. If the Ski School is unable to cover all requirements for private lessons due to capacity reasons, the Client will be offered an alternative time schedule, or group lessons. Group lessons will only take place if there are at minimum 5 clients in the group. If the group is not full, the Client will be offered an alternative time schedule (a different course with comparable parameters), or a different method of training. If group lessons are extended, the price will be calculated based on the difference between the price of the new course and the original one. The Client will pay the difference so the price is corresponding to that of the new course as per the pricelist. The Client must complain about the course, or an individual lesson in person without any unnecessary delay when the course or lesson has finished. Complaints can be filed with the Owner's Office. Every single complaint will be resolved with the Client individually and immediately when filed. The Client's rights are governed by the Act no. 89/2012 Coll., Civil Code, as amended. Based on circumstances, the Client has above all the right to claim a reasonable discount on course fees or termination of the contract. The Client is unable to continue ski lessons due to injury or illness if a medical certificate is produced stating the Client is unable to attend ski lessons due to injury or illness. If as a result, the Client does not participate in the skiing course at all, full refunds will be provided. If the Client has attended some of the lessons, pro-rata refunds equal to the unused lessons will be given by the Ski School. The Client filed a justified complaint about the skiing course as per Section 32 hereof and to this end, the Client claimed termination due to defective performance. In this case, the Client will be given pro-rata refunds corresponding to unused lessons. Cancellations more than 12 hours prior to the start of the first lesson. Cancellations less than 12 hours prior to the start of the first lesson if a medical certificate of injury/illness is produced. Changes to paid ski lessons – more clients (private and family lessons) or lesson extension. Cancellations less than 12 hours prior to the start of the first lesson without producing a medical certificate of injury/illness is produced. Changes to paid ski lessons – fewer Clients (private and family lessons) or shortening of lessons. Cancellations of unused lessons if a medical certificate of injury/illness is produced. Cancellations of Lesson 1 if the lesson was cancelled before 50 % time of the lesson elapsed (1 hour lesson – 25 minutes / 2-hour lesson – 50 minutes). Full refunds of other unused lessons will be provided. Cancellations of Lesson 1 if the lesson was cancelled after 50 % time of the lesson elapsed (1 hour lesson – 25 minutes / 2-hour lesson – 50 minutes). Full refunds of other unused lessons will be provided. Cancellations of unused lessons without producing a medical certificate injury/illness. Changes to paid ski lessons – fewer Clients or shortening of lessons. The operator shall process personal data (including but not limited to identification, contact and address data and booking data or on-line orders for lessons (hereinafter as the “lessons”) of the skiing school and snowboarding) on your part, if you are a natural person, and other persons involved in booking or on-line orders for the lessons, for the purposes of booking, ordering, payment for and provision of services, for marketing communications*, presentation and promotional activities*, protection of rights*, internal administrative and statistical purposes* and fulfilment of obligations according to the law. An objection to the manners of processing indicated as * may be sent to the address gdpr@lipnoservis.cz. The personal data under the preceding paragraph may be transferred to other recipients whose act in the roles of processors or other controllers. By paying the course fee or completing the online booking process, the client confirms to have been duly informed of all of his/her rights and all facts that must be communicated to the client by the operator in the role of a controller. These general terms and conditions will enter into full force and effect as of December 1, 2018. The Owner reserves the right to amend these general terms and conditions. Amendments to GTC will become effective on the date of publication.